Cell sorting moves cells from an entry point where a heterogeneous population begins, to a selection zone where a subpopulation is selected, and finally to a diversion zone where one subpopulation follows a different path than the rest . The need to sort heterogeneous cell populations is expanding to the isolation of rare target cell populations such as the enrichment of circulating tumor cells (CTCs), hematopoietic stem cells (HSCs), and circulating fetal cells (CFCs). biopharma industries for diagnostics, in theranostics, and in personalized medicine. The earliest, best known methodology is fluorescence-activated cell sorting (FACS), where a cell is selected based on its fluorescence. This technique is associated with high efficiencies and requires a flowing stream. FACS is the technique against which all others are benchmarked. There are three types of cell sorting: fluorescence label-based; bead-based; and label-free. Within each category, there are a variety of mechanisms for selection: optical forces, electrokinetic, acoustophoresis, magnetic, mechanical, or passive. Depending on the fluorescence efficiency of the target, wavelength, and limit of detection (LOD), glass or fused silica tends to be the material of choice due to its low auto-fluorescence. Even if other materials are required, such as those for electrodes, glass is still a strong choice since high quality electrodes can be cost-efficiently manufactured on glass wafers utilizing standard photo-lithographic processes. 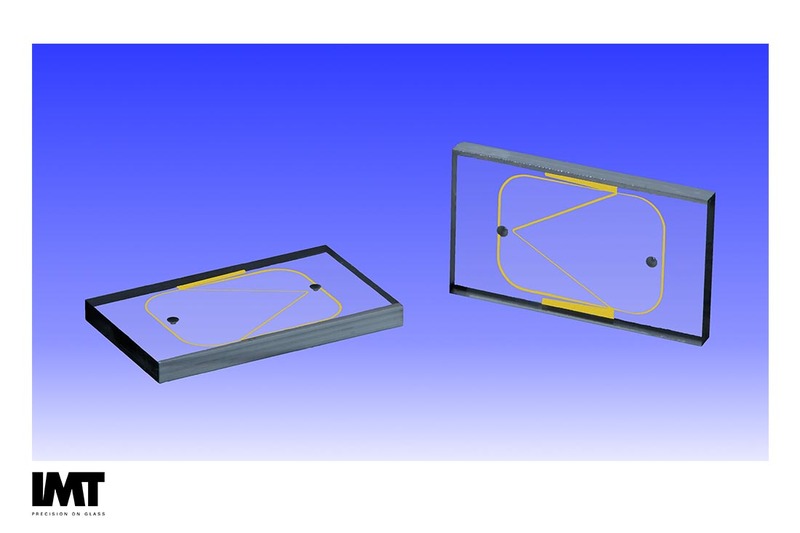 However, for acoustophoresis and magnetic applications, depending on the level of integration required, silicon-metal-glass hybrids may be a better choice because of the CMOS fabrication and integration processes available for the silicon substrate. Label-free methods are not necessarily free from the optical transparency and low auto-fluorescence requirements that drive the choice of glass. If native fluorescence is measured or optical/optoelectronic tweezers are used to move cells, then glass, or a glass-hybrid, is often the best material. In addition, label-free electrokinetic methods still benefit from the favorable high dielectric constant of glass, not to mention the ease of depositing and patterning electrode materials on glass. and the ease of patterning electrode and other materials, silicon, silicon/glass or a silicon hybrid/multilayered material, is often the best choice for label-free acoustophoresis and magnetophoresis. For passive cell sorting, glass, silicon, or polymers can be used successfully depending on feature size, the feature or device geometry, the aspect ratio desired, and the optical and chemical properties required. As is always the case, the analysis approach embodied in the design of the in vitro diagnostic being developed drives the material selection for cell sorting applications. An interesting methodology for cell sorting has been demonstrated at the Department of Biochemistry, School of Medicine, Stanford University, where the magnetic levitation of single cells was used. In this work it was demonstrated that each cell type (i.e., cancer, blood, bacteria, and yeast) has a characteristic levitation profile . The method enables rapid, density-based imaging and profiling of single cells with intriguing applications, such as label-free identification and monitoring of heterogeneous biological changes under various physiological conditions, including antibiotic or cancer treatment in personalized medicine. Cells were distinguished with a resolution of 1 × 10−4 g·mL−1 . Active methods such as FACS, magnetic activated cell sorting (MACS), dielectrophoresis, acoustophoresis, and optical force switching can suffer from a loss of efficiency as flow rates increase. Passive sorting methods, such as pinched flow fractionation (PFF) and deterministic lateral displacement (DLD) circumvent these difficulties but lose effectiveness with cells and other bioparticles due to particle elasticity. Inertial microfluidics is a passive, label-free, minimally invasive, and high throughput solution for sorting cells based on size. Applications to cell sorting including sorting CTCs, neuroblastoma cells and mesenchymal stem cells . For many of these wide-ranging approaches, even label-free methods, glass may still be the only material that meets all the specifications for the device. While there are cell sorting approaches where silicon, polymers or hybrid materials are the best selection, glass often wins because of its optical transparency and high dielectric constant . C. W. Shields, C. D. Reyes and G. P. Lopez, "Microfluidic Cell Sorting: A Review of the Advances in the Separation of Cells from Debulking to Rare Cell Isolation," Lab Chip, vol. 15, no. 5, pp. 1230-1249, 2015. N. G. Durmus, H. C. Tekinc, S. Guven, K. Sridhar, A. A. Yildiz, G. Calibasi, I. Ghiran, R. W. Davis, L. M. Steinmetz and U. Demirci, "Magnetic levitation of single cells," PNAS, pp. E3661-E3668., 2015. S. Shiva, P. Nathamgari, B. Dong, F. Zhou, W. Kang, J. P. Giraldo-Vela, T. McGuire, R. L. McNaughton, C. Sun, J. A. Kessler and H. D. Espinosa, "Isolating single cells in a neurosphere assay using inertial microfluidics," Lab Chip, vol. 15, no. 24, pp. 4591-7, 2015. A. M. Skelley, O. Kirak, H. Suh, R. Jaenisch and J. Voldman, "Microfluidic Control of Cell Pairing and Fusion," Nat Methods. , vol. 6, no. 2, pp. 147-152, 2009.